In my teaching this summer I see the need to create examples to demonstrate how to design learning experiences that are at the redefinition stage. Teachers need to see examples to understand what to strive for as they progress through the stages. There needs to be something concrete to discuss as we walk lessons up the line. 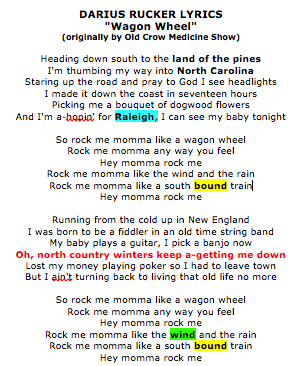 So, since I have been playing around with the Wagon Wheel activity, I thought I would mention that this is an example of redefinition. Take a sneak peek here or click the link to contribute to this work in progress and watch it grow! Yesterday I created an interactive image to demonstrate how easy it is to engage in collaborative leaving with ThingLink. If you explore the live image, you will discover the Padlet online board that is being used to assemble collaborator’s thoughts. 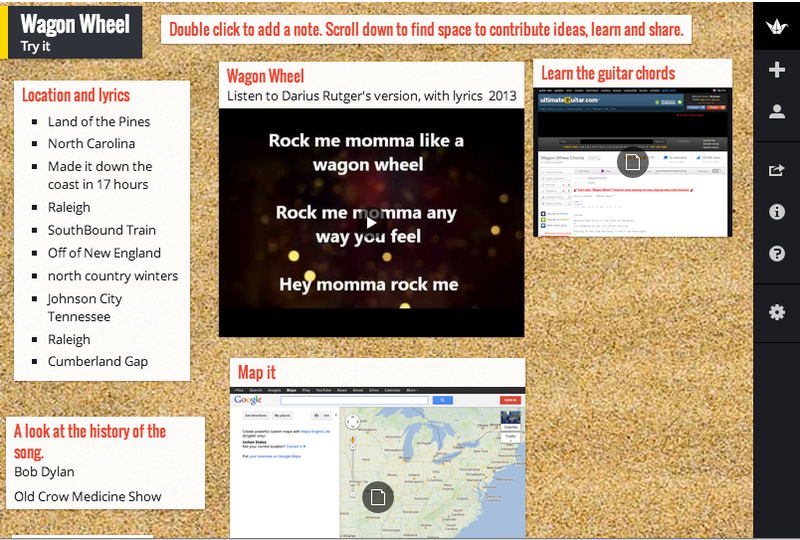 I’ve pulled some of the ideas together and have been adding them to the ThingLink to define the song through multimedia. Now I am digging deeper to connect standards and design a student driven learning experience. I recently added instaGrok to the bulletin board for one click access to a useful interactive learning tool and search engine. 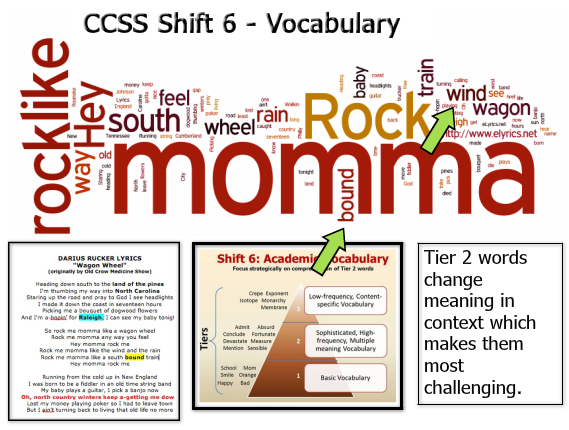 I used the Mastery Connect App to quickly reference the CCSS and demonstrated a way to use Wordle as a starting point to engage students in a CCSS aligned vocabulary activity. Let’s not forget Digital Citizenship. All images are linked back to original sources and credit is given. Creative Commons Share Alike Licenses are always appreciated. There are many untapped learning opportunities to be pulled out of the song. I am looking for resources to make good learning good connections. Feel free to tap on the Padlet and add ideas and links or suggest learning connections you see. Stay tuned and watch it grow. 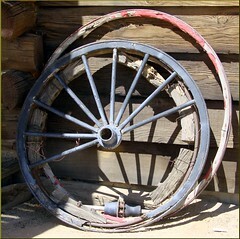 The Wagon Wheel is growing nicely! Just having a bit of summer fun today sharing and collaborating about music. Join us! Time for a bit of summer fun. Please click on the link to contribute ideas to kickoff a project with Padlet. Without a doubt, the most useful reference tool I use when planning CCSS aligned technology powered learning experiences is Common Core, by Mastery Connect. I have the widget installed on my websites and wikis. I have the app on my iPad and iPhone. I use MasteryConnect when designing learning experiences to provide me with quick and easy access to snippets of the information I need. With that information at hand, I can fine-tune the learning experiences I design to target skills necessary for success in school and beyond, as identified by the CCSS. If you haven’t tried CommonCore, you should. 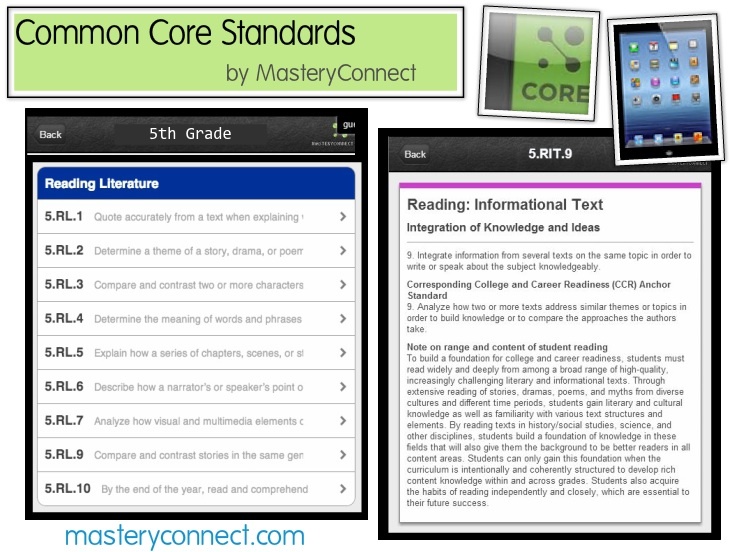 Get the Common Core Standards App in the iTunes store or visit MasteryConnect.com to learn more and get the widget. 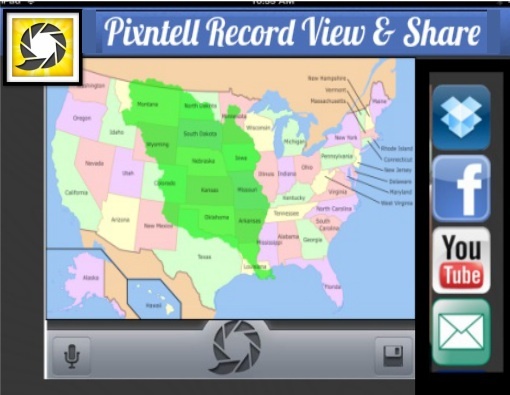 Pixntell is free app that allows users to quickly create and share a narrated slideshow of pictures. 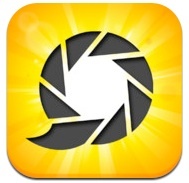 Just add photos, record narration and share newly created videos via DropBox, FaceBook, YouTube or email. You can even apply special effects to photos if desired. The app couldn’t be simpler to use! Students can take snapshots of work samples and write a script to demonstrate learning, then narrate and share the final project for use as an authentic assessment tool. Students can capture photos of everyday classroom learning activities and write a script to record reflections about the experience. Teachers can use the tool to front-load the learning by creating a photo slideshow for viewing as homework prior to class, to provide a starting point for classroom instruction. Google Docs Presentation is well-suited for use as a tool for short student driven research projects because of the availability of efficient integrated research tools right on the page. Earlier this year I designed a template to introduce teachers to the usefulness of the tool. The purpose of the template is for use as a starting point to help teachers plan and implement technology driven learning experiences that are fueled by Essential Questions and aligned to Common Core Standards. The template includes built in screencast tutorials to help students learn to use the technology. This allows teachers to focus on the content instead of being consumed by student questions about using the tech. After all, technology is a tool for learning, not a subject area. It is meant to be integrated, not isolated. 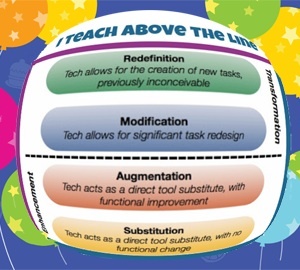 It should be noted that the template is like a recipe that produces end products that are all very similar, and it was designed to help teachers and student build their tech expertise and increase their comfort level with tech integration, but it is not the end goal. 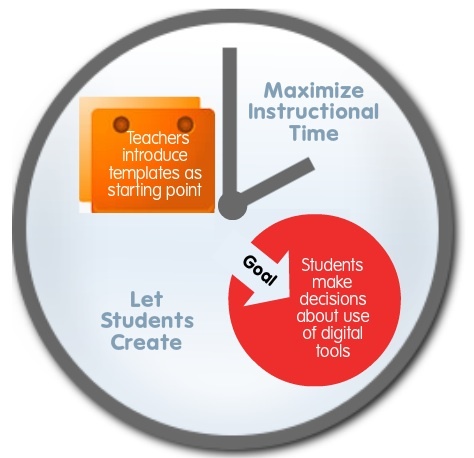 The goal for teachers is to eventually feel comfortable enough to design their own flexible lessons that allow them to get out of the way and let students make their own choices about which digital tools to use to complete research and present knowledge and ideas. Please consider the template to be a helpful stepping stone to guide the learning. The template is available for modification and reuse. Feel free to edit the topic. Just change the Essential Question and modify the template to create your own Multimedia Research project. Please use it to jump start the process of using technology as a tool for learning, but once you are comfortable, please keep going. Choose Use This Template and a copy will be added to your own list of Google Docs. Feel free to edit the topic. Just change the Essential Question and modify to create your own Multimedia Research template. Earlier today I presented a webinar for Simple K12. I packed a lot of content and resources into the 30 minute presentation so I am publishing the interactive slideshow here. The slideshow has plenty of links to explore. These resources can be viewed at your own pace. Note: To view everything on each slide, click the bunny slippers instead of the arrow to advance the slideshow. Click the X to view full screen. Good news! 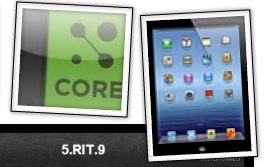 There is still time to catch some awesome Common Core webinars today at Simple K12.